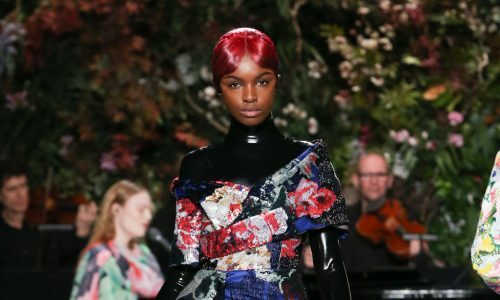 Belstaff’s autumn/winter collection “Great British Roots” took place at Belstaff’s home in Mayfair, and was all about honouring the strong roots of the brand and its steady journey while creating excitement for its future. 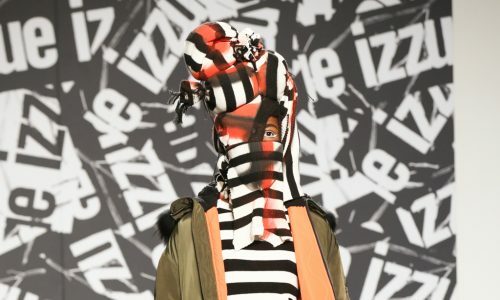 The guests were invited to view an installation that represented the unpacking of the brand’s past, showcasing four historical time-frames that now acted as settings for new, modern collections. 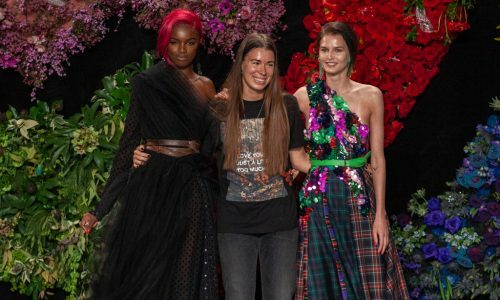 Each presentation was dominated by large packing crates with the purpose of creating excitement, the props suggesting the spirit of adventure or preparation for a journey. 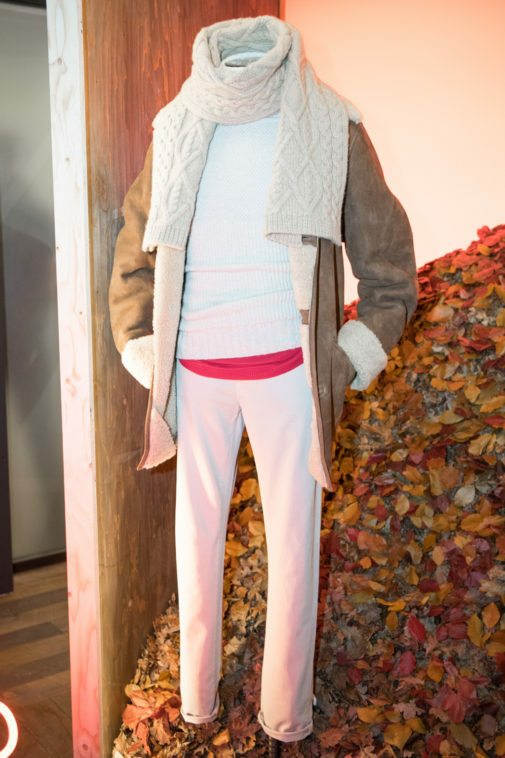 The compass-points were connected through high-quality fabrics and finishing touches: hand-waxed leather and cotton, Merino wool and cashmere. The first setting was the “Outward Bound”, a scene extracted from the 1920s, when Belstaff was most affiliated with the world of hiking, camping and exploration, creating mostly protective and waterproof travelling gear designed in partnership with the mountaineer Sir Chris Bonington. 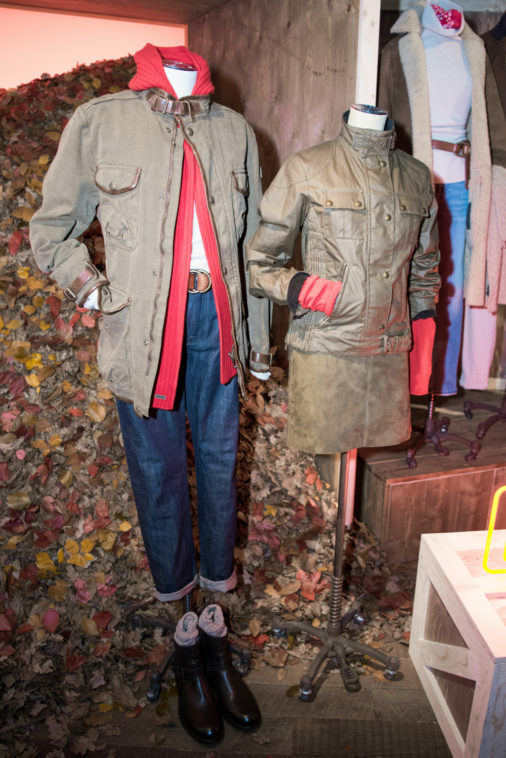 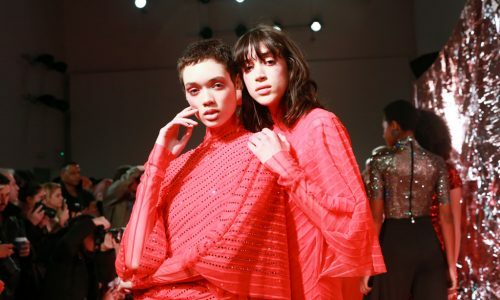 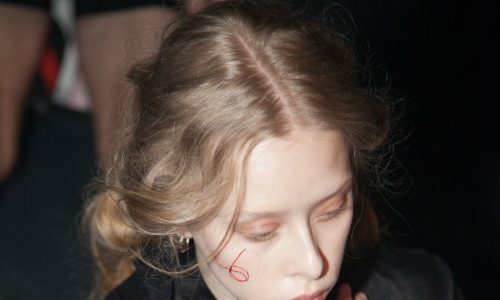 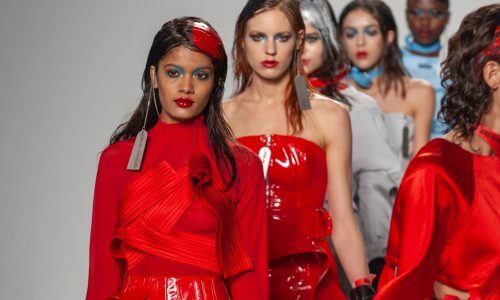 Today, the sense of exploration remains strong within the brand’s identity; this is why they inaugurated a new Belstaff Red, which was presented against a backdrop of logs and leaves. 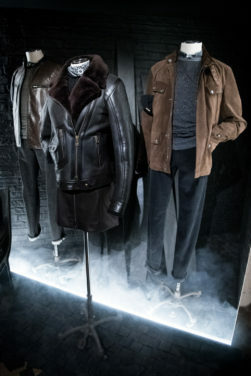 Here the label featured innovative menswear jackets such as the Wing jacket, which is made out of dry waxed cotton with a canvas feel, the Shearling Car Coat in chestnut and the Journey jacket in broken-in, while for womenswear the attraction is the luxurious Earhart flight jacket in lightweight chestnut suede. 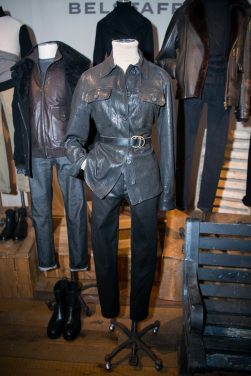 The second compass-point was the “Dockland”, which intertwines with the Navy, as Belstaff was well-known for making military uniforms and protective kit. In a place where ropes, pulleys and chains are dominating the scene, Belstaff brought silver and olive to their new collection, besides the old navy and dark indigo tones – the key fabric being Melton wool. At the Dockland compass-point, the emphasis was on modernisation, bringing two classics up to date: the Indigo Racemaster and Indigo Trailmaster jackets which were reimagined and rinsed, featured in dark, modern denim. 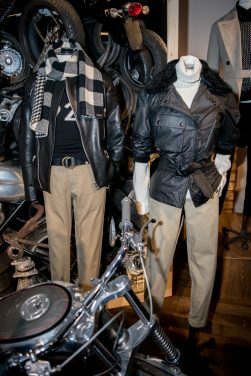 Unquestionably, “the Machine Age”, the third scenery in the Belstaff narrative, was the best reflection of the modern image of the brand, encapsulating a love for the machines associated with adventure. 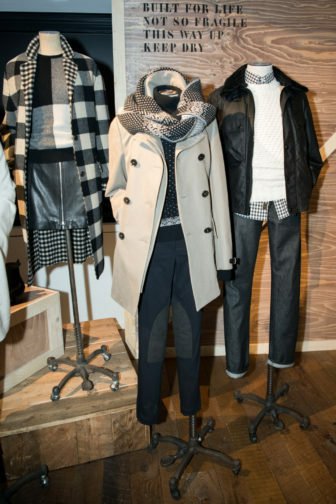 This urban collection featured fabrics such as leather, waxed cotton, shearling and wool in hues of black, bone and blackberry, while black biker boots with straps and buckles completed the looks. 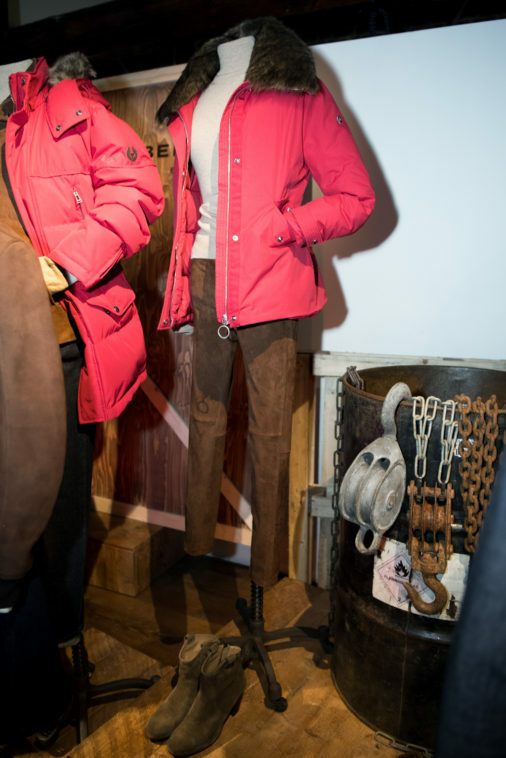 For the last setting, Barbour referenced industrial development, and its years of creating functional garments using technical fabrics and waterproof materials either for local factories or for the British Army during the First World War. To achieve a handcrafted look, for this collection the tones remained neutral: black, brown and grey –the brown leather jackets contrasted by cable-knit woollen jumpers. 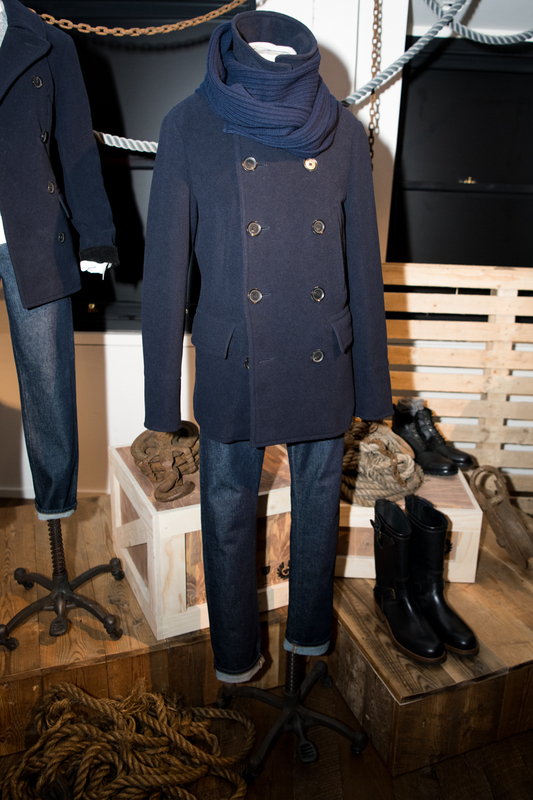 Here the trail jacket also made an appearance, referencing the uniforms of the military forces serving land, sea and sky.